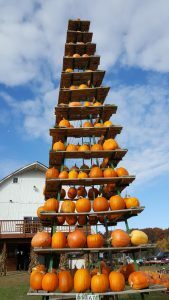 A tower of pumpkins at Mommsen’s, a great place to check out along County SS (the old U.S. 53) between Cameron and Rice Lake. Halloween weekend is here! November is next. We’re cooling down, the leaves have changed (mostly, you can still get some color in places), and we’re moving towards the holiday season, which will have plenty of changing scenery, fun events, and outdoor activities! Check out what’s left of the Fall Color Report from Travel Wisconsin, and enjoy a barrage of events coming up or scenic points of interest like the fourth highest waterfall in the country east of the Rockies. Visit attractions like the unique Johnson Wax Research Tower in Racine, designed by Frank Lloyd Wright (Wisconsin Highways 11, 20, 32, 38, I-41/94; the National Freshwater Fishing Hall of Fame in Hayward (Wisconsin Highways 27, 63, 77); the John Michael Kohler Arts Center in Sheboygan (Wisconsin Highways 23, 28, 42, I-43); beautiful Willow River State Park just outside of Hudson (Wisconsin Highways 12, 35, 64); or the Wisconsin Maritime Museum and Rahr-West Art Museum in Manitowoc.